What's a good solution for a city that does not allow banners in their building codes? Window Graphics are the perfect solution to get your image and your message seen by everyone that enters your premises! 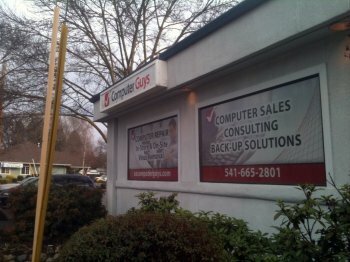 Window graphics do not require a permit in most cases so it's a great way to eliminate the red-tape and cost that permits incur. If you have a blank window it's reasonable to want people to see other people inside your business; this can draw them in. But what happens when there is just a few, or maybe no customers? 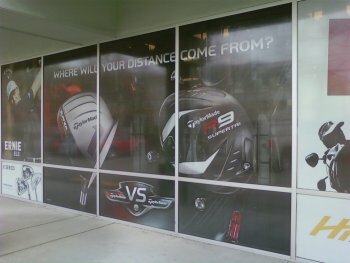 Window graphics with bright colors and the ability to see out, but not in can help with that problem. It provides an attractive storefront at all times that limits the problems that occur with the natural ebb and flow of business. Your location will always be inviting no matter what the time of year. With a wide variety of graphics, photos and font styles there's really no limit to what you can advertise with these graphics. These types of graphics are great for sports outlets or gyms where sunlight coming in though the windows can become an issue late in the day. We've seen demand from all kinds of clients to include restaurants, boutiques and flower shops. Big splashes of color can make your storefront location much more attractive and memorable. Our high resolution photos and expert graphics placement will help you put your store on the map! These will also work perfectly inside any office that has a glass window or door where privacy is a concern.